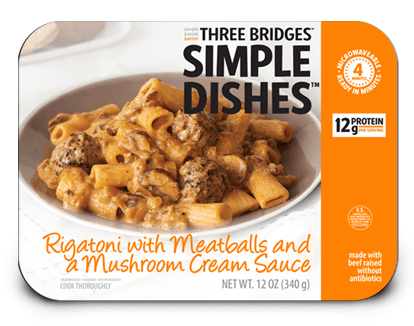 Introducing NEW Simple Dishes from Three Bridges, available at our King Kullen stores! Perfect for lunch or a quick dinner. These dishes are packed with protein, hormone free cheeses and antibiotic free meats. Ready in under 5 minutes! To prepare in the microwave, remove plastic film from the tray, cover with a paper towel and microwave on high for about 3-4 minutes. Let sit for one minute before serving. To prepare in the oven, preheat your oven to 350F. Remove plastic film from tray and place on a baking sheet before placing in the oven. Cook for about 15-20 minutes. 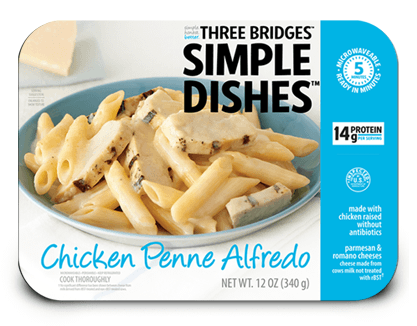 Chicken Penne Alfredo – Alfredo sauce with tender penne pasta and ABF white-meat chicken, topped with aged Parmesan cheese. 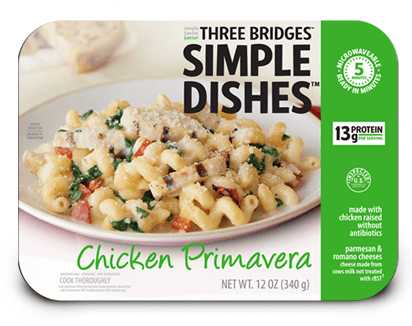 Chicken Primavera – Tender cavatappi pasta with ABF white-meat chicken in a creamy sauce with spinach and roasted red peppers. 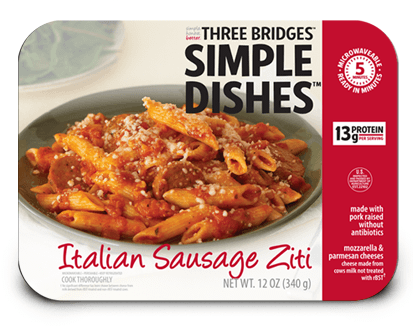 Italian Sausage Ziti – Sweet marinara with ABF Italian sausage, Mozzarella cheese, and tender penne pasta, topped with Parmesan cheese. Rigatoni with Meatballs and a Mushroom Cream Sauce – Seasoned ABF meatballs over rigatoni with a classic stroganoff sauce of veal stock, Dijon mustard, mushrooms, & caramelized onions.